Thank you, Elle, for reminding me in your “transportation ‘planning’ downtown” that I wanted to write about I Street. Note: If you are looking at Google Maps, it does not show the current lane configuration on I Street since the repaving and re-striping project of last fall, nor the realignment of tracks and work on extending 5th and 6th streets over the tracks. I Street in Sacramento approaching the train station is a mess. Starting with the confusing floating bike lane between 7th and 6th streets (subject of a future post), the street becomes worse and worse: five lanes wide, high speed, and completely unfriendly to bicyclists and pedestrians. For pedestrians, the crossing on the east side of the I/5th intersection is uncomfortable because westbound traffic is already moving at high speed and often runs the red light, and right turning cars from I to 5th often do not yield to pedestrians in the crosswalk. The west side is so unsafe due to traffic turning left off 5th Street, it is signed against pedestrian crossing, even though this is a logical walking route from downtown to the train station. A crosswalk has been added on the east side of the I/4th intersection, but it has the same challenges that drivers are moving too fast and often run the run light. When I used this new crosswalk, I was very concerned, and I have a much higher tolerance for danger than most people do. The right-most two travel lanes lead to the high-speed northbound I-5 freeway onramp, so drivers passing 6th Street are already accelerating to freeway speeds, many times going 55 mph as they cross through the I/5th intersection. 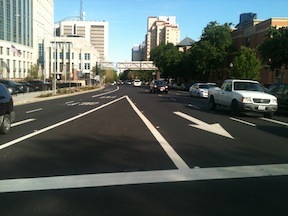 The next two lanes lead to a medium speed onramp to the I Street bridge over the Sacramento river, and to the southbound I-5 onramp. For pedestrians, the only way to go westbound towards Old Sacramento is to go through the parking lot for the train station and under the onramps along an ugly, dark, poorly marked pedestrian way.